In Q3 of 2017, I worked with the Leadership, Marketing, Product, and Customer Success teams to redesign our website's framework and update all of its content. The previous site was a result of urgent band-aid fixes and new pages that were added without consideration for the rest of the site. As a result, the site: featured outdated messaging and brand positioning with little mention of our core offerings; had extraneous pages in the navigation that made the site architecture confusing, resulting in a suboptimal user flow and occasional dead ends; was not SEO-friendly or optimized for lead conversions. The Marketing team accomplished our goals: demonstrate content marketing expertise; improve the user journey to improve lead capture; establish a solid WordPress foundation that would allow for scalability and easy maintenance. We continue to use this framework today, which has greatly increased efficiency and speed for smaller updates. 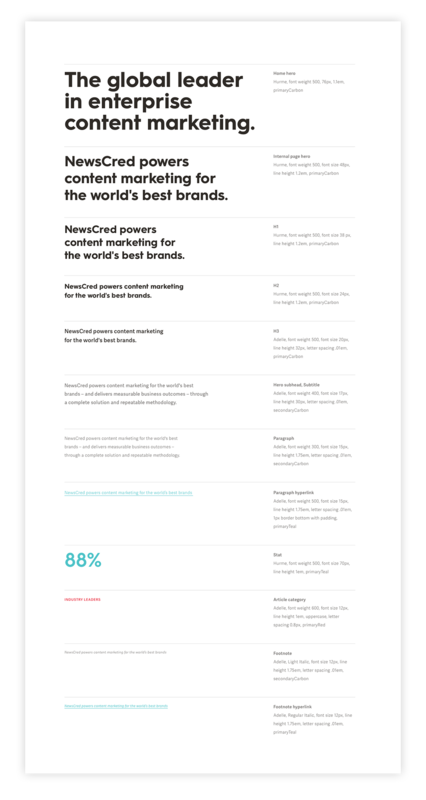 To learn more about the project's process and results, please see the detailed article I wrote on NewsCred's Insights.